Disclosure: This recipe was created for Ancient Harvest. See below for more details. The majority of time, if I’m going to make holiday cookies, I’ll make them with all the butter and sweetener. To me, the occasional cookie during the holidays doesn’t warrant a special “healthy” cookie. It’s a treat and meant to be a something special which is why you won’t really find any cookies marked as healthy around this site. However, there are a couple of treats I can’t make because I’ll eat them all. In one sitting. 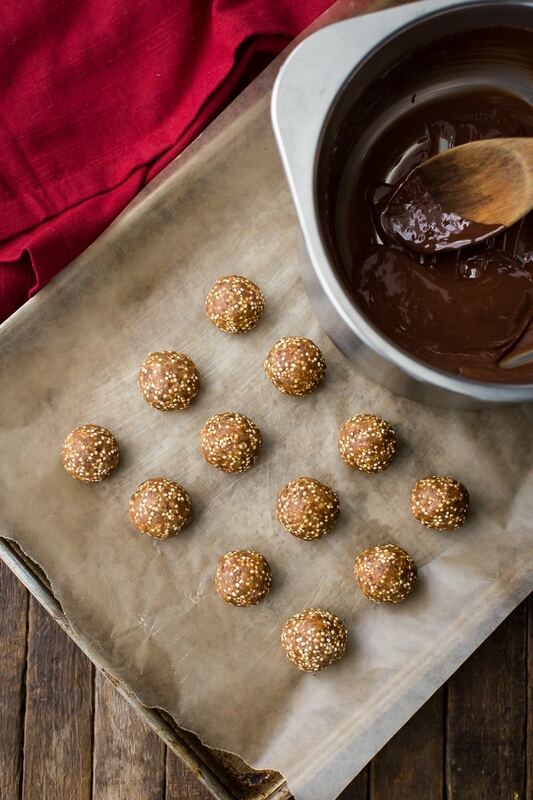 The traditional buckeye (a peanut butter ball with chocolate coating) is one of those treats. I’m a sucker for peanut butter and chocolate. 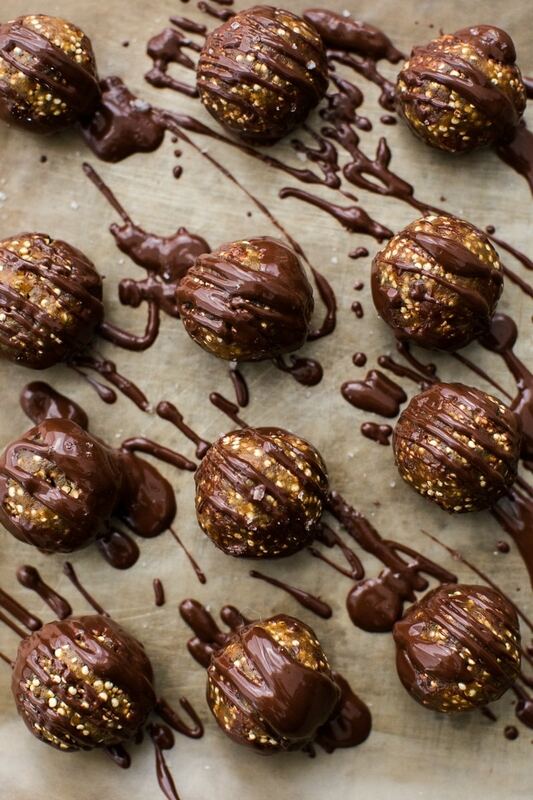 This particular recipe is a riff from Edible Perspective’s date buckeye ball with peanuts and A Couple Cook’s variation on that buckeye ball. My added ingredient? Popped quinoa. It adds a nice crunch to the texture (not found in traditional buckeye recipes, but still good). Plus, it keeps with the healthy theme of these treats! 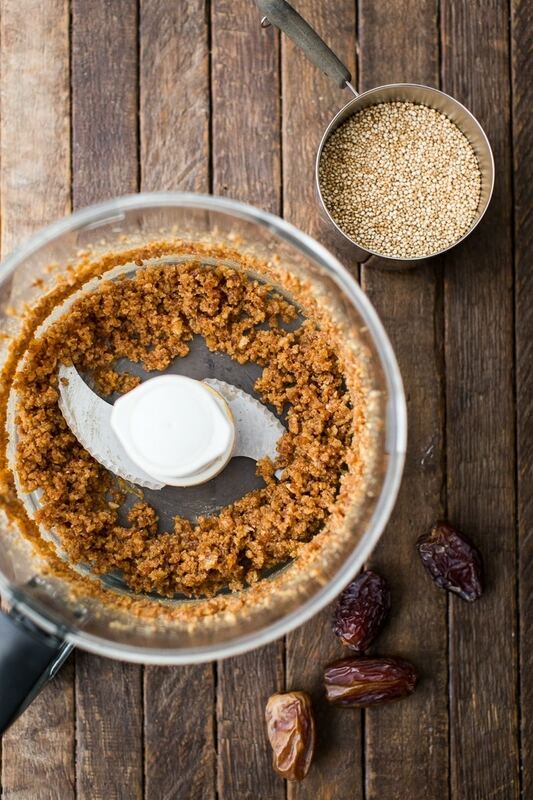 Remove pits from the dates and place in a food processor. Pulse until dates are in small pieces. Measure in the peanut butter and vanilla extract. Continue to pulse until the mixture is well combined. Add in the quinoa and pulse a few more times to incorporate quinoa. Take roughly 2 tablespoons of the mixture and roll into a ball. If the ball cracks and doesn’t roll easily, pulse in a tablespoon of water and check again. Roll mixture into 12 balls and place in the refrigerator. In a double boiler, heat chocolate and coconut oil until smooth. 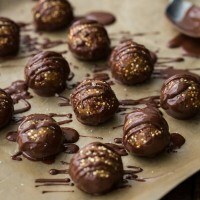 Take each ball and dip the bottom in the chocolate. Place on wax paper and repeat with remaining balls. If you have leftover chocolate, drizzle over the top. Once chocolate begins to firm, sprinkle with sea salt if desired. Peanut Butter: I used peanut butter that had salt. If your peanut butter doesn’t, you may need to add a pinch to the mixture. Also, if your peanut butter has a looser texture, start with 3 tablespoons of peanut butter and add more as long as the mixture isn’t too soft. 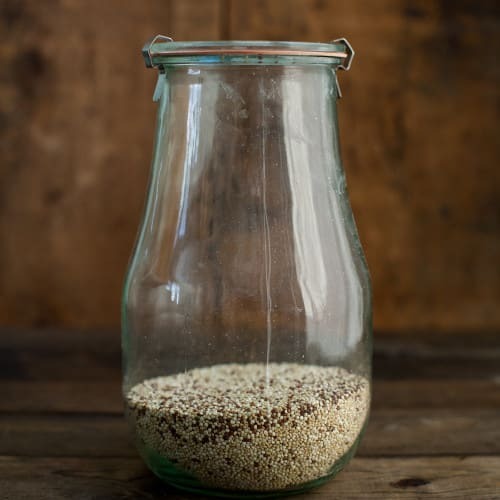 Instructions for popping quinoa (and other pseudo grains) can be found here. I’ll be honest and say that I haven’t deviated much from the above recipe as the combination of peanut butter, quinoa, and chocolate is really good. However, there are some ways you can mix the ingredients up. Peanut Butter: I’ll always be a peanut butter and chocolate girl but almond butter or even sunflower seed butter can be used. Quinoa: I think quinoa works best in this recipe but you can also pop amaranth and use in place or with the quinoa! Chocolate: If wanting to keep these vegan, be sure to pick up vegan chocolate. If you get on a kick of popping quinoa, it can be kind of fun and can be used in quite a few different ways. Granola: Toss popped quinoa in with your granola or use in place of your granola on a yogurt parfait. Salads: Popped quinoa adds a nice, healthy crunch to salads. Granola Bars: Add to granola bars along with oats and other nuts/seeds. Disclosure: This recipe was created for Ancient Harvest as part of their brand ambassadorship program. All thoughts and opinions are my own. It’s content like this that helps me keep this site running to provide the vegetarian recipes you see every week. Ughhh goodness these look delicious. 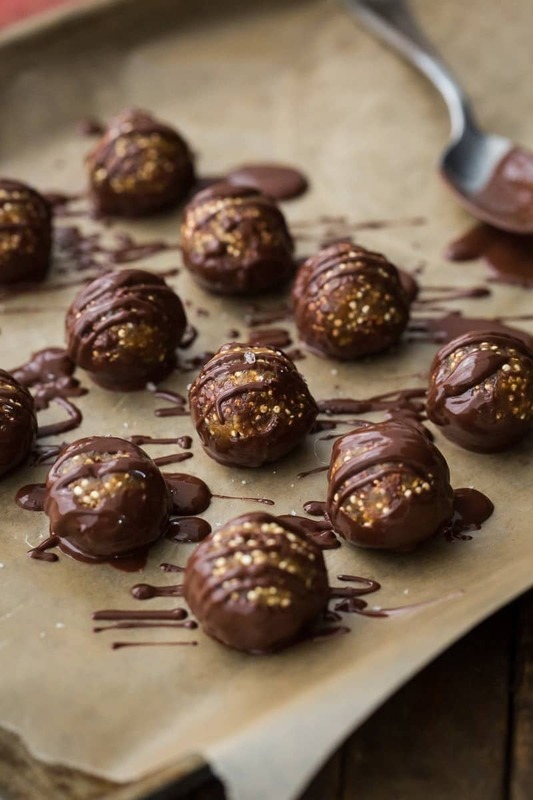 I’ve always been a fan of microwave melted chocolate with a spoonful of peanut butter as a late night treat, but these look like an elevated, sophisticated version of what I would typically eat in my bed.